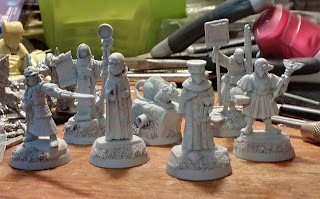 Since then I made up this little warband of 'less martial' figures who then sat on the top of my bureau to gather dust and cobwebs (literally), whilst I worked on other projects (my Elven Exiles are growing apace). I've always been meaning to properly build up the world of Pūrvachāti much in the same way as I did with Lychgate last year. In fact, the roots of Pūrvachāti started out quite a few years ago, beginning with my love of the ancient ruins of India and Thailand and their contrast with the more contemporary structures seen in the countries' today. 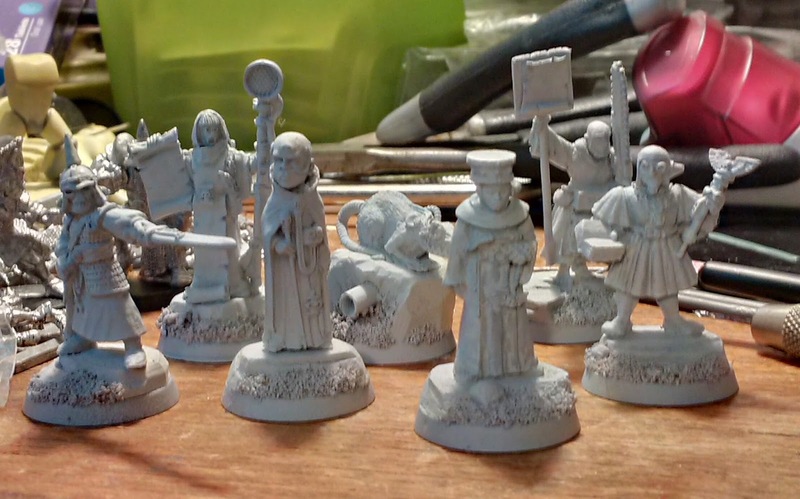 Originally, I intended to paint these guys in very subdued colours in a similar palette to the Dutch Masters. However, now I'm more leaning towards something more impressionistic, something of a grubby riot of colours. On the one hand, these models would be perfect for such a subdued and desaturated palette. But on the other, such a palette would be incongruous to the backdrop I'm concocting (which would favour the grubby impressionism and give credence to the title of Grime Lights).